I have developed great interest in what really makes chess players perform well. Our Chess Program is headed by Dr. Tim Redman. He insists on good diet and physical exercise as the best factors to improve our performance. He has gone to great lengths to buy all the chess players books that contain food types which are suitable for chess players and other sportsmen. Prior to the All-Africa Games (Abuja, Nigeria), one of the renowned coaches in USA, Larry Gardner was hired by our University (University of Texas at Dallas) to head the Sports Department. He has worked with the Miami Dolphins and Stanford Swimming Team (the best college team in USA). Dr. Redman could not wait to invite him so he could talk about diet and other factors that make sports men outperform their opponents. Mr. Gardner insists that a player facing an opponent of similar abilities is likely to outsmart the opponent if he is in better physical shape by any significant difference because it leads to loss of concentration for the disadvantaged player at one stage. I wondered as I heard him speak. I also sometimes lose concentration and blunder, but in my case, this usually happens when so much is going on my personal life. The only thing I wonder about then is why there is always something negative going on in my life at times of tournaments (though I have managed to excel in some tournaments despite this). I decided to work on my physical shape, but the diet routine was a problem. I could not imagine myself counting the amount of calories or carbohydrates I would take. I said to myself, "This is nonsense!" The best I could do was to eat the recommended food types without paying attention to the amounts. The African Team and Individual Championships were very important to me. Instead of training, I spent more than a week trying to figure out the best strategy. My only form of training I undertook for the championship was a few blitz games on ICC before bedtime. I have used the word training, but it's probably not the best word. Training in chess is probably preparing a new idea before a tournament. In this period, so much was going on in my private life, and I had exams to take care of as well. I thought of friends to contact so I could share chess ideas with them but they were busy. GM Lev Aronian was going to be of much help, but he had a tournament against Karpov, Polgar, and Sokolov scheduled at the same dates as the African Individual Championships. The only friend I managed to schedule an appointment with was IM Rade Milovanovic. My roommate was the only close guy around to chat to about several issues. We have had minor differences before, just like most people who share the same roof but he is always a great guy to turn to. The tournament was getting closer and the problems were far from over as new ones had come on board. I had spent 3400 minutes on the phone talking to people I share primary and secondary relationships in three weeks as I was to discover when I got back from Nigeria. That's close to 57 hours... when I showed my friend Greg the bill, he quipped, "Imagine if you spent that time studying chess." To avoid getting despondent, I increased the numbers of hours I spent at the gym before I left for Nigeria. I also became very attached to the kids I teach chess every afternoon of the week. They helped me increase levels of patience and tolerance and I overcame several pounds of stress whenever I am with them. I hope that, one day, one of them will make me proud if they improve. I met Rade three days before departing for Nigeria. There was nothing much we could do, but just talking to a chess player before a tournament is usually a good idea. His view was that I lose most games because I get tired in the middle of tournaments. This was true, and I was amazed at his uncanny observation. I was not worried about this as I had done my homework at the gym. "The team members were in good spirits. They were analyzing positions and seemed to have already adapted to the environment. I went to my room and worried about the approach to use as the games were hours away. The first question that came to my mind, was, "How was I going to play chess without new preparation in this computer era?" By the departure day, time had run out for me to spend on personal issues as I had to focus on chess. I first read the Art of War to see how much it's related with chess as I thought of several approaches to use for the tournament. I arrived in London at Gatwick Airport in the early hours of October 3rd. The connecting flight was 10pm from Heathrow Airport. I booked a lounge inside the airport terminal. I asked for a much quieter room where I could rest uninterrupted. I arrived in Nigeria the following day. The team members were in good spirits. They were analyzing positions and seemed to have already adapted to the environment. I went to my room and worried about the approach to use as the games were hours away. 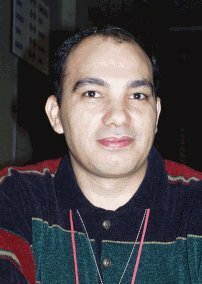 The first question that came to my mind, was, "How was I going to play chess without new preparation in this computer era?" I looked in my preparation database and all I found was unfinished analysis in almost all the openings. I jumped from opening to opening and I ended up finishing nothing! I decided I would rest the first game (as I was expecting us to play a less heralded team) and start in the second round. To my surprise, the first game was against Egypt. There was no way I was going to rest for the sake of peace. My teammates would accuse me of ducking opponents if I rested when the opponent I was scheduled to play was strong in their eyes. I played an expected variation. Even though I had managed to get a good position, I eventually lost against IM Fouad El-Taher after an oversight. The first thing I said loudly to myself was, "The tournament is too long for Amon to waste energy on getting upset." After losing to El-Taher, I resorted to my other occupation as a semi-business man. I sold the items I had planned to sell on the free day and was very happy at the end of the day as the business went perfect. The demand was more than supply. 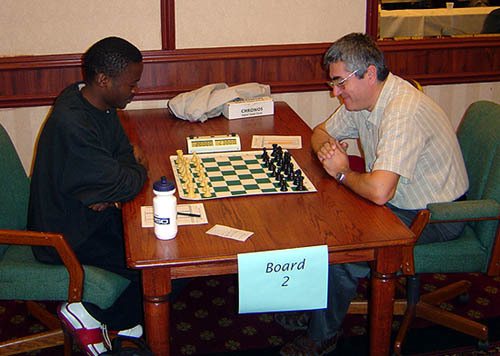 The next game was against John Cochrane (Zimbabwe). I did not want to play the Sicilian because I was tired of playing it. The second question I asked myself was, "what other opening is there for me to play?" I know the ideas about all the openings, but choosing the right opening is always a problem. I chose the Pirc Defense, an opening which was fresh in my mind because I used to give a few ideas to one of my friends who liked it. Having missed a win, I was only able to draw. After the disappointing second round draw, I won the remaining games including a miniature against the Libyan number one to mint a Silver medal. After winning a Silver medal and contributing to the team's Bronze medal, it was time to focus on the individual championship. I had received a few good wishes in the first half from friends and I must say, I read them at the moments when I needed them. I came up with the strategy below for the individual championships. When playing with White pieces I must play for win against any seed. Play for a win against anyone below 2400 when playing with Black pieces. Play to get an equal position as soon as possible and save energy against anyone above 2400. This was a realistic goal, but I left an allowance for disappointment. The first game in the individual championships was against Cochrane. I managed to draw even though I was a piece down. Even though, the game is a million miles away from beauty, I admire the character I exhibited after I blundered. I stayed calm till Cochrane panicked and made my day slightly unpleasant by letting me escape with a draw. The strategy for the individual worked for the four of the first five rounds. 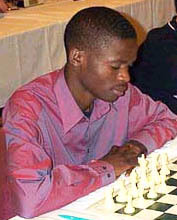 Before I write about the sixth round, let me briefly examine the round five game against IM Aikhoje Odion (Nigeria). He came thirty minutes late, a move which usually upsets me in tournaments.